Taken from Interweave Crochet Magazine - '11 Spring: A fun take on the granny square! 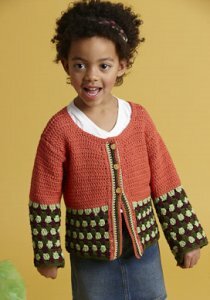 This bohemian cardigan is both cute and versatile for the playground and for home! This pattern is in Interweave Crochet Magazine - '11 Spring, page 34. Size US G crochet hook and three 1/2" buttons are required but not included. Finished Chest Measurements: 23.25 (25, 27, 28.75, 30.75)". Gauge: 17 sts = 4". Colors Shown are #317 Coral Pink, #303 Sprout, #318 Blackberry, and #313 Basil.